This past Spring, Bob and I decided to participate in Community Supported Agriculture (CSA) for the first time. Admittedly, I didn’t know much about a CSA before this year. A CSA is where individuals enroll in a “share” with a local farmer. The share is priced for the growing season, and the CSA benefits both the farmer and the individuals. The farmer knows how many people are purchasing shares for the season before the long days of the growing season start. The individuals also pre-pay for the whole season, which is another benefit to the farmer. As a CSA participants, there are many benefits. 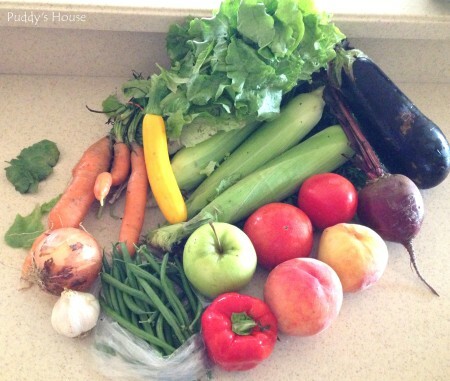 You get local, fresh, seasonal produce each week. You also know exactly where your produce is coming from. Most likely, you get to know the farmer too. 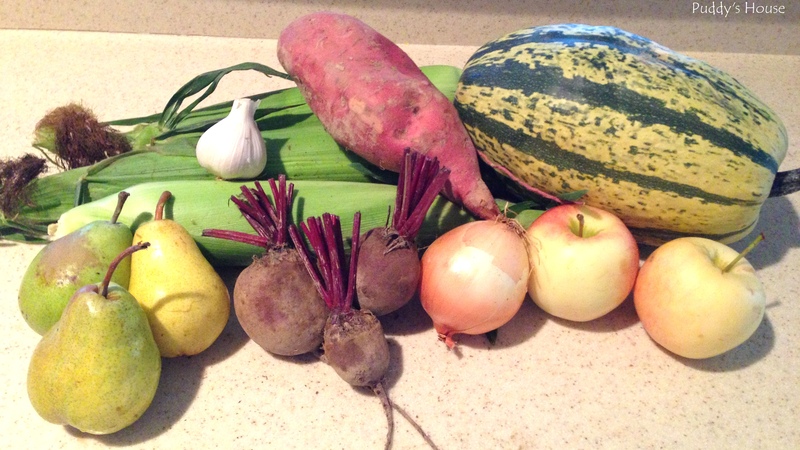 And, hopefully participating in a CSA gets you to try a larger variety of produce. Most farmers offer full and half shares. A full share is usually sized to feed a family of four. With our specific CSA, we had some additional options. My employer was a pilot site for a CSA to workplace program. So, instead of going to a farm each week to pick up our produce, our share was delivered directly to my work. And, to make it even easier to decide to participate, I was able to payroll deduct my share cost over the course of the season. Another option we had, was that we were able to partner with another individual to purchase a full share and just split it each week. A full share with our farmer was $500 for the season, whereas a half share was $300 and only delivered every other week. So, it made sense to split a full share, especially since it is just Bob and I eating the produce. If you are local and interested, our farm was The Creekside Farm Market. Farmer Josh was great to work with and it was a successful program at my worksite. Our season ended up being from June through early October. That is one risk of the CSA – your produce depends on the growing season. If it is a bad weather season, it can effect what you get each week and also how long the season will last. But, it can also benefit you – if it is a great growing season, you will reap the benefits of it. 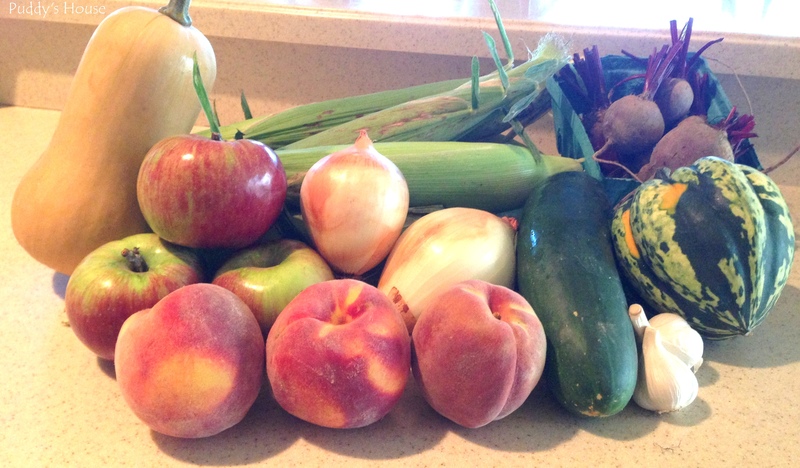 So, while I was so excited the first week and took a picture of our share, I didn’t think anything of it again until early August, when I was just so amazed at the volume of produce that week and took another picture. From then on, I tried to take a picture each week (these are all quick Iphone pictures) before I washed and put the produce away, or even started to cook it right away. Below is a picture of preparing the vegetables in late June – I supplemented with store bought potatoes, but the rest were vegetables from our share. I think it was also the first time I used garlic scapes. They provided great flavor. We just added some olive oil and sautéed everything together. It was so much fun to see what we got each week. Some weeks it was challenging to evenly split the full share into 2, ie. when we got 1 eggplant. But, we just would rotate it week to week, or just choose how to share based on what we liked. 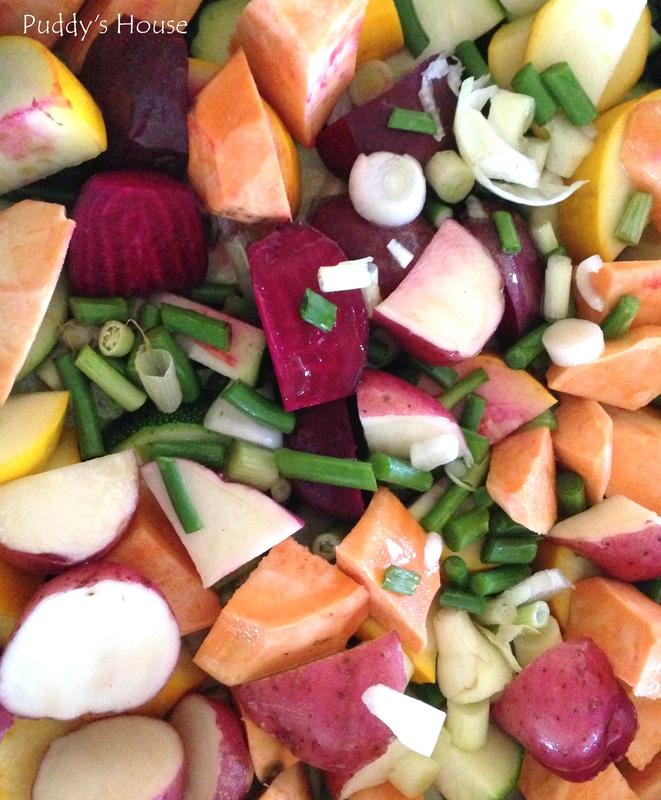 The produce you receive in a CSA depends on your farmer. At work, we chose our farmer based on his variety of produce, which included fruits and vegetables, price, and location. 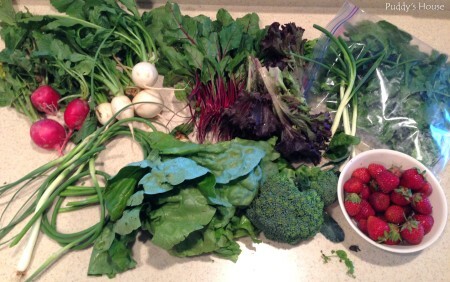 Since we live in a farming area, there were plenty of CSA farmers to choose from, and its definitely a personal decision. I had never even heard of a delicata squash, let alone know what it looked like – its the item in the top right of the picture above. So, what did I do, but I asked on facebook what it was and quickly got an answer with a recipe. 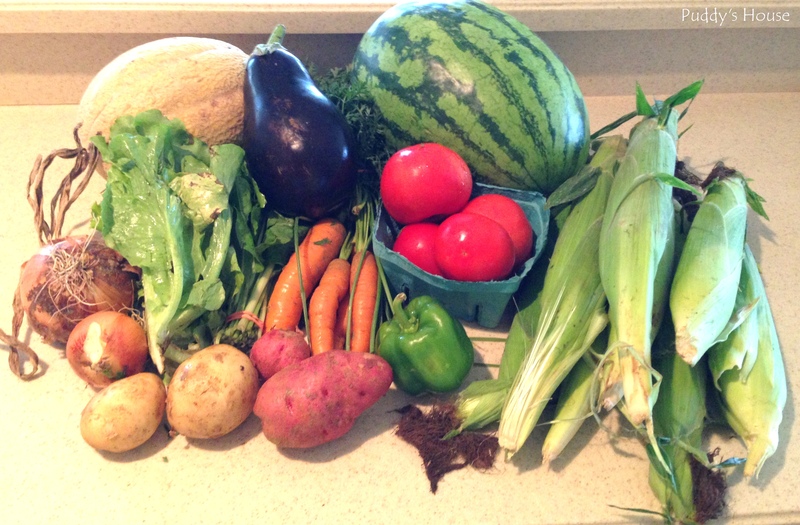 I really enjoyed that aspect of the CSA. It forced me to try new produce. I also found I was determined to use it. I did not want to waste items that I knew we paid for, so we made good use of what we got each week. 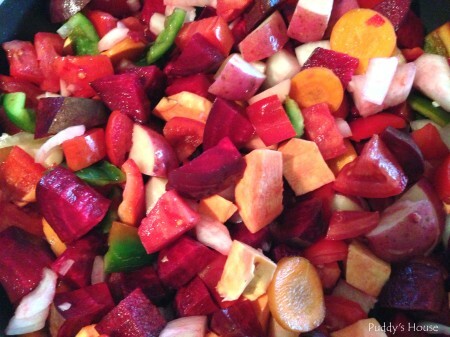 Our go to method was to just chop everything and throw it all together into a pan to sauté. No matter what the combination, it always tasted good. Bob and I enjoyed the CSA so much, we were very sad to see it come to an end. And, I realized I had fully adjusted to getting the produce each week. One of the first weeks after it ended, my grocery shopping was terrible – my meal ideas by mid-week were pathetic. I was used to having the produce inspire my meal ideas that when I went back to pre-planning on the weekend, it was quite an adjustment. Since we realized how much we enjoyed the CSA, we found a different one that offers Fall shares and signed up for a half-share. 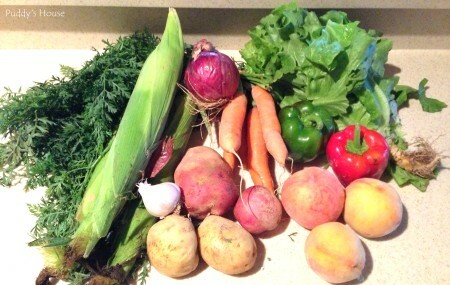 This CSA is Lancaster Farm Fresh Cooperative. As the name indicates, it is a cooperative of many farmers, all of which are certified organic. 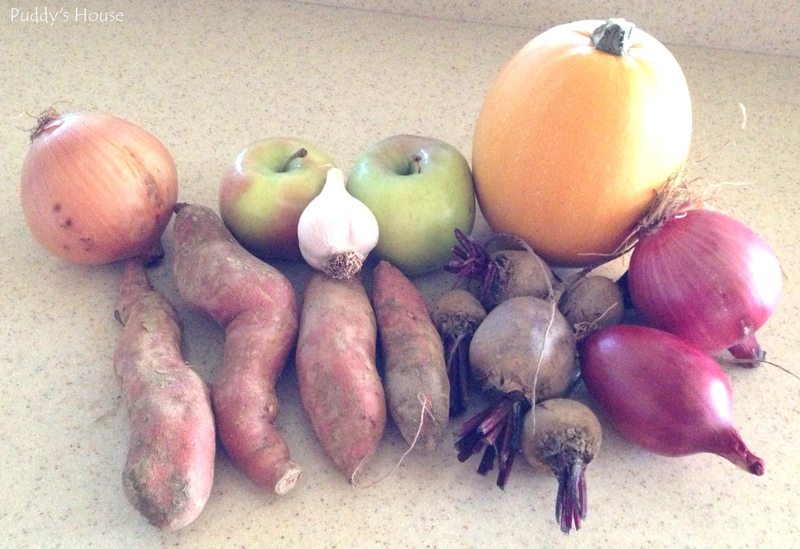 The Fall half-share provides us with produce for 7 weeks. Because it is a much larger program, it seems to be operated slightly differently than the CSA we participated in earlier this year. With Farm Fresh, we received an email last week with the details of our share as well as a recipe to use the produce. This CSA is not through my work, so we had to select a pick-up location each week and we must pick-up within designated hours on that day. All is this is pretty normal with a CSA, we just were very spoiled by the convenience and flexibility we had with our shares at my workplace. I am hopeful that we will get to do that again next year. 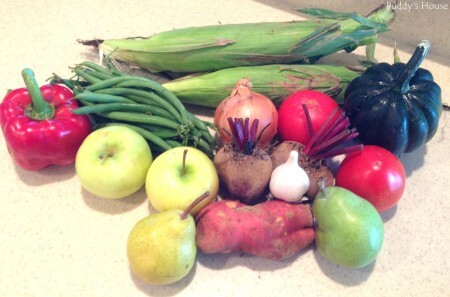 Until then, we will try out the Fall CSA so that we can enjoy more local, fresh produce. Do you participate in a CSA? Hello! I'm Leslie Wireback and the owner and creator of Puddy's House. Puddy is our cute little dog. I love to yard sale and thrift shop, paint just about anything, use my creative energy on projects, all while trying to enjoy life.